Provides 40 hours of classroom-based learning. A new era in life insurance legislation means new requirements for practitioners. To begin your career as a Life Insurance Agent, or if you are planning to add Life Insurance to your portfolio of financial service offerings, you’ll need a mandatory HLLQP (Harmonized Life License Qualification Program) license. Today’s licensing requirements first require mandatory certification through a regulator-approved training program, followed by a licensing exam. As an agent of an approved provider (Seneca College) of this mandatory pre-licensing program, ITAC Incorporated is leading the way by offering HLLQP instruction in Atlantic Canada. This course covers the principles of life insurance, the evolution of companies and financial ratings, product distribution and types of insurance and investment products and more. Much of the learning comes from hands-on experience with a widespread use of Case Studies. Led by excellent, certified instructors with industry experience. The program is leading edge, based on a hands-on approach, case studies and team learning. Course materials are high quality and extensive, developed for a major College and provide excellent reference material for on-the-job. Access until pass the provincial exam. Successful students obtain the certification needed for HLLQP exam eligibility. Program qualifies for Continuing Education credits. Students who achieve a minimum grade of 60% will be registered with CIPR to write the Provincial HLLQP licensing examination. This certification is valid for a period of 12 months from date of issue*. The new Harmonized LLQP will be offered Monday to Friday from 8:30am to 5:00pm each day. The certification exam is available for students to write on-site on Saturday. New learning materials consist of 5 modules; 4 of which students will be tested on. Students will write the certification exams following the end of the course. The cost of the new Harmonized LLQP is $1700.00 plus HST. The fees include 40 hours of instruction with industry expert, 5 printed modules and unlimited attempts at the certification process. 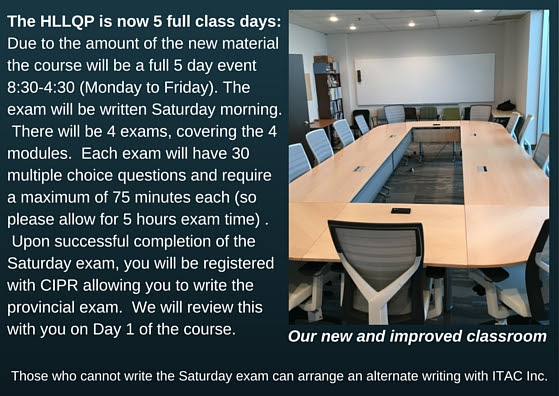 Each modular exam will consist of 20 or 30 multiple choice questions and students must receive a minimum of 60% per module exam (4 in total) before they can be certified for the Provincial exam. Student’s progress will be tracked through the Canadian Insurance Participant Registry (CIPR) system. Text – Learning materials consist of 5 modules. Life insurance agents sell life and health insurance products and insurance-specific investments including segregated funds and annuities. To become a licensed life agent it is necessary to complete the Harmonized Life Licence Qualification Program (HLLQP) with a certified content provider, pass the provincial LLQP exam, and register with a provincial insurance regulator. Seneca College’s, Centre for Financial Services is leading the way in providing such an approved training program through a collaboration that is making the LLQP available throughout Canada. ITAC Inc. brings this training here to the Atlantic Provinces: we help you get set up online with your materials and books, reserve you a seat in the next available classroom date and provide a comfortable learning environment. This convenient, accessible, college LLQP program is designed both for individuals (e.g., those interested in entering the industry and financial service specialists who want to provide life insurance), and also for companies who want to train agents and other employees. Available in Atlantic Canada at a convenient, accessible location. ITAC Inc. has a 16-year track record of developing high-quality insurance programs. Classroom courses have an 85%+ pass rate.